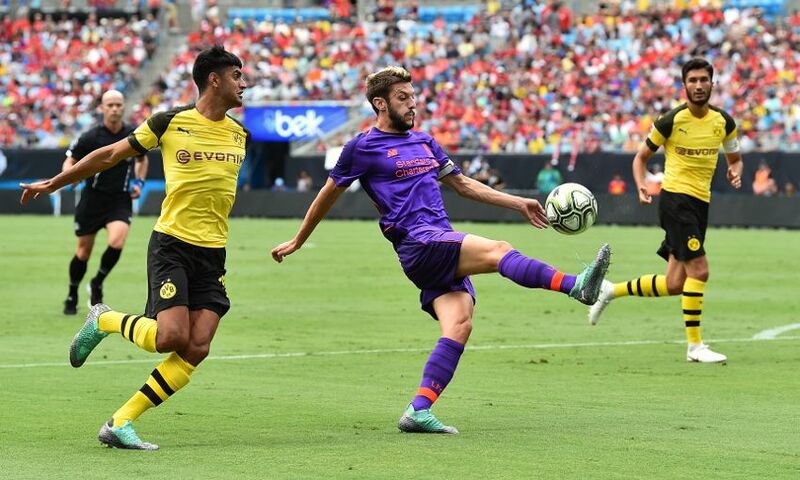 Liverpool suffered their first defeat of pre-season as Borussia Dortmund claimed a 3-1 comeback victory in their opening International Champions Cup fixture in Charlotte on Sunday. 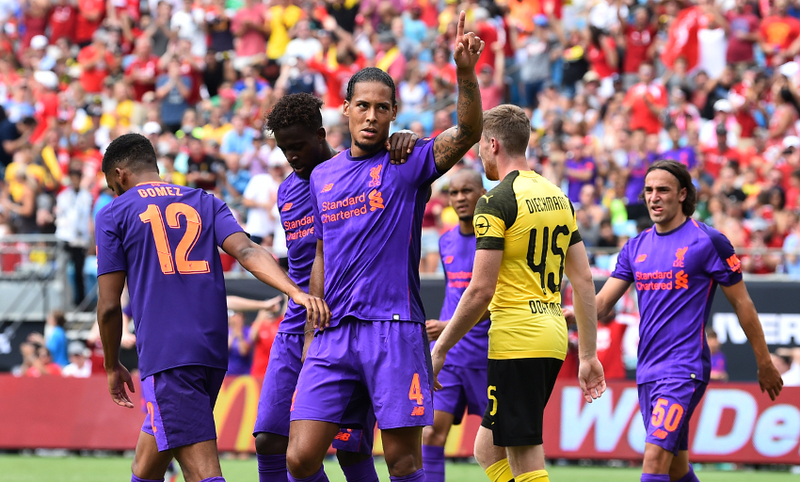 Virgil van Dijk’s header was the difference between the two sides – Jürgen Klopp’s current and former – in the first half at the Bank of America Stadium, where 55,447 fans were in attendance. The Reds had the upper hand in the early stages of the second period, Sheyi Ojo hitting the bar, but Christian Pulisic won and converted a penalty to level and then slotted home another goal one minute from the end. Jacob Bruun Larsen added a third for Dortmund with a close-range finish in stoppage-time to inflict a harsh scoreline on Klopp’s men. Liverpool survived a fourth-minute scare when Loris Karius came out of goal to retrieve a ball over the top but found Maximilian Philipp with his attempted clearance. The Dortmund No.20 was unable to profit, however, as his immediate strike towards the empty net rolled the wrong side of the right post. In the opening quarter-hour it was the Bundesliga side dictating the flow of the game, though without causing any real concern to the Reds’ organised defence. Liverpool’s rhythm was halted further when Joel Matip was forced off with an injury. The centre-back pulled up after trying to spread play out to the right flank and was replaced by Joe Gomez. But momentum turned on 25 minutes. Rafael Camacho spotted the chance to set a short corner to Andy Robertson and the Scot’s swinging cross into the middle of the BVB box was met effortlessly by Van Dijk with a firm header beyond Marwin Hitz. Both sides moved the ball well in the restrictive, 30-degree heat and Marius Wolf might have done better than squaring straight into the palms of Karius when Mahmoud Dahoud carried the ball to the edge of the area. Klopp made eight changes at the break and Liverpool were the more dangerous team upon the resumption, with Daniel Sturridge at the centre of much of their productive work. Excellent footwork in a tight spot on the left edge of the box almost created a chance for Ojo before James Milner was unlucky with a long-range curler that sailed just over the upright. The Reds No.7 turned provider from another short corner, lofting a delivery to the back post that Dominic Solanke nodded back across goal but inches wide. Luck was against Liverpool on 64 minutes. Quick pressing from Ben Woodburn gave possession to Sturridge, who nimbly stepped around his nearest marker and sent a diagonal pass to the free Ojo. But the winger’s low shot struck the goalkeeper and lifted onto the crossbar. And, within moments, Dortmund equalised. Ragnar Klavan was harshly judged to have fouled Pulisic as he tried to break into the area and the USA forward took responsibility to beat Karius from 12 yards. And the BVB No.22 settled the game in his team’s favour in the final minutes. First, a rapid breakaway along the left set up an opening that Pulisic took full advantage of by sliding a precise effort across goal and into the bottom left corner. And it was his shot from inside the Liverpool area that was parried by Karius into the path of Bruun Larsen two minutes into added time for a Dortmund third.